If you are facing an issue with no sounds on your canvas plus built, please try following fixes. Try to install following plugin to your cocoon project. Just add the line above to your config.xml at Cocoon -> [Your Project] -> config.xml. I found out, that with 2.2.0 there is no need to install any additional plugin to get sounds working. It’s important to use the acurate audio file formats for each platform, iOS and Android. If you add a “.wav” audio file to Construct 2, it mostly can be converted to “.ogg” and “.m4a” automatically. If there is an issue, please check your audio files. 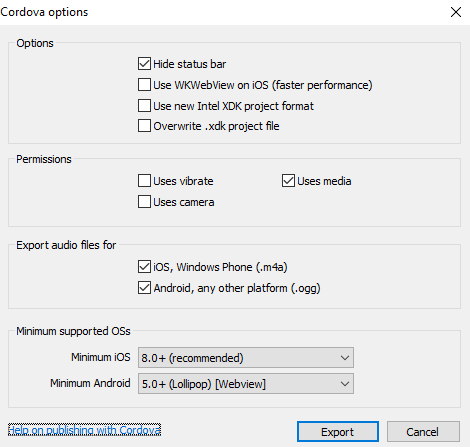 Also enable both checkboxes at “Export audio files for” on the Construct 2 export options window.